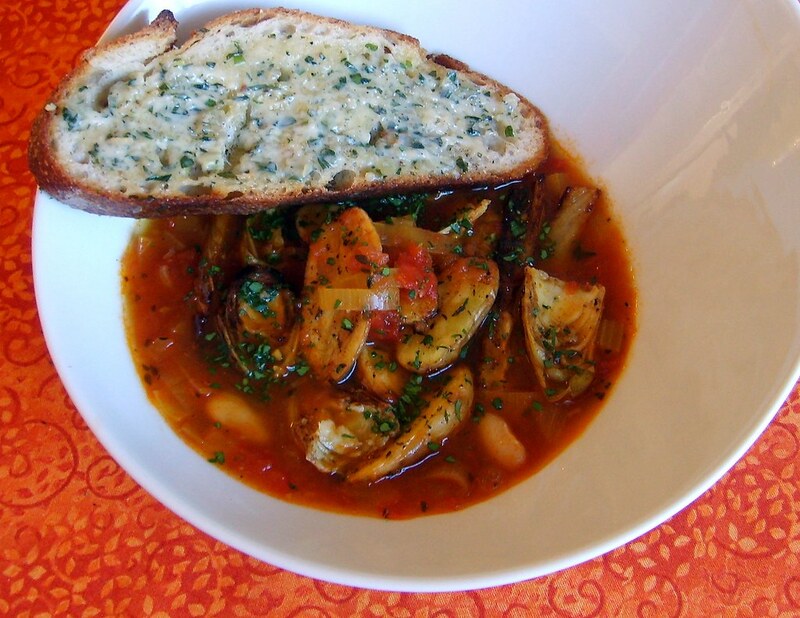 Bouillabaisse is a Provencal Fish Stew originating from the City of Marseilles in the South of France. The most important part of the stew is the broth and the spices that are used that give it its unique flavoring, such as saffron, fennel seed, and orange peel. Bouillabaisse really reminds me of the Mediterranean and the freshness of the sea and so I wanted to capture those same flavors in my vegan version. Not only is the broth identical to what you might find in a small cafe in Marseilles, but the different textures used in the soup make it quite satisfying as well. This is a great soup to enjoy year round, even on a warm summer night. I know that the ingredient list looks long, but it's no different than making any other soup from scratch if you are using a homemade stock. You can also purchase prepared artichoke hearts instead of making your own to save time. In a large dutch oven or stock pot, heat olive oil and saute vegetables until tender. Add white wine and cook until reduced by half. Add spices, herbs, filtered water, kombu and nori and bring to a boil and reduce to a simmer. Simmer stock for about an hour until almost reduced by half. Strain stock through a fine mesh strainer and set aside. You should have about six cups of liquid. 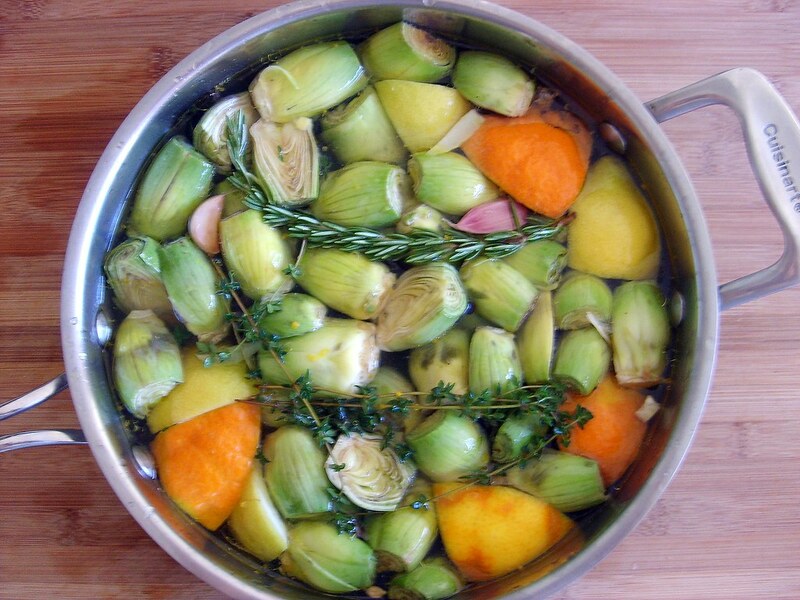 Before you start preparing the artichokes, you need to prepare the acidulated braising water first. This will keep the artichokes from browning while you're trimming the entire batch. When preparing the artichokes, make sure that you peel off the tough outer layers. It may seem like you're wasting a lot of the artichoke, but there's nothing worse than chewing on a tough piece of artichoke. Bring artichokes to a boil, reduce to a simmer and cook covered until really tender, but still holding their shape, about 30 minutes. When artichokes are finished, drain and remove herbs, citrus and garlic cloves. Set aside. 1 leek, white and light green parts only, sliced in half lengthwise and then sliced in 1/4 inch slices. Wash leeks really well in a colander before using. In a small bowl add white wine and crumbled saffron and let sit for 10 minutes. In a large dutch oven or stock pot, add olive oil, onion, celery and garlic and cook until soft. Deglaze with saffron-wine mixture and cook until reduced by half, about 4 minutes. Add herbs, spices, orange zest, tomato puree and stock and season with salt and pepper to taste. Bring soup to a boil and reduce to a simmer and cook for about 30-40 minutes until thickened somewhat and flavors have combined. Preheat oven to 425 degrees. Slice potatoes in 1/2, toss with 1 tsp chopped rosemary, 1 tsp chopped thyme, 1 tbsp extra virgin olive oil and salt and pepper to taste. Roast in oven for 20 minutes until golden brown. 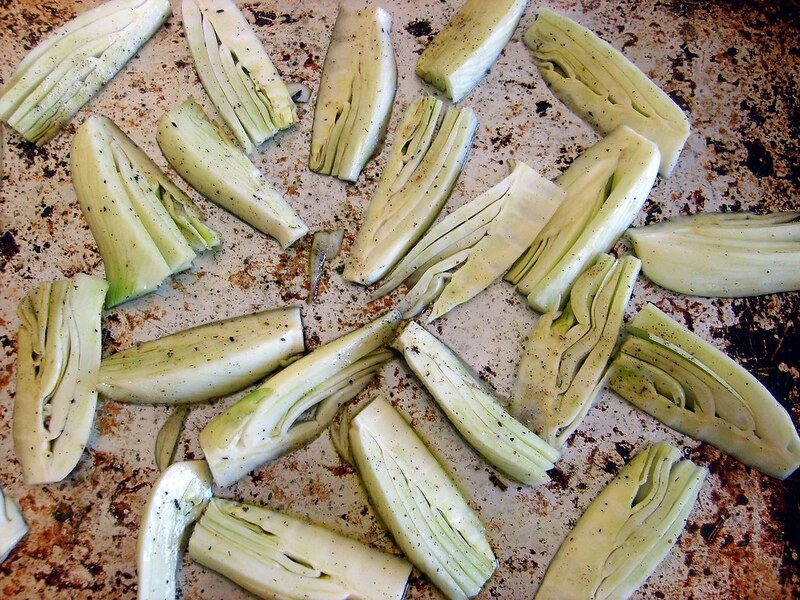 Slice fennel bulbs in 1/2 lengthwise and then slice into 1/4" thick slices, keeping the core in tact. Toss with olive oil, salt and pepper and roast for about 20 minutes until golden brown. Below is a picture of the cut fennel, before roasting. You can see that the core is still attached to the leaves so that they don't fall apart while roasting. To finish the soup, add cannellini beans, braised artichokes, roasted potatoes and fennel to soup base and heat through. Add salt and pepper if needed. Ladle soup into bowls and garnish with fresh minced parsley. I served my soup with a toasted crostini smeared with Tarragon Butter. I had some Tarragon Butter leftover from July 4th and I wanted to use it up. It goes really well the Bouillabaisse.